One of the first clues to a big power build is catching a glimpse of a front mounted intercooler through the front bumper. Most people know that any boosted car benefits hugely from being intercooled, with almost all turbocharged engines having some sort of intercooler from the factory. Some factory intercoolers are fairly effective, but even lightly tuned cars can benefit from an aftermarket setup, and as with many modifications, power is only part of the story. In very basic terms, making power involves getting as much air into the engine as possible and then using it to burn as much fuel as possible, however the purpose of an intercooler is to reduce the temperature of the intake air. The more air is compressed (the more boost you run) the hotter it gets - this is due to the same law of physics that helps the diesel fuel burn without a spark in the highly compressed air in the cylinders. Unfortunately hot air is less dense than cool air - this means less air in the cylinders, throwing away the benefits of the extra boost! Standard intercoolers fitted to TDIs come in various shapes and sizes, some of which are more effective than others. 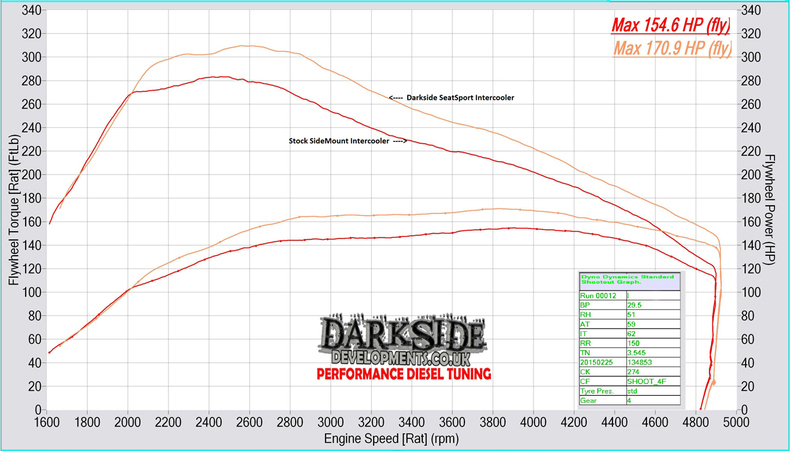 Seat Ibiza / Skoda Fabia / VW Polo PD130s are one of the most popular cars we tune at Darkside - as standard these have a side mounted intercooler, and the performance is very poor. A standard car with a custom remap will often see intake temperatures approaching 100degC. It is difficult to tune these vehicles to more than about 165bhp on our dyno for one run each pull gets less power and smoke increases. An upgraded front mounted intercooler can easily release an additional 10bhp without any tuning after, with the intake temps brought down to below 40degC even on a hot day. All Mk5 platform cars however have a large front mounted intercooler fitted from the factory - this is far more effective than the small side mounted units and can keep intake temperatures at acceptable levels even with upgraded turbochargers. There are two other reasons why an intercooler might be changed. The first is durability - even if intake temperatures are not necessarily an issue, standard intercoolers (or poor quality aftermarket units) are often not capable of withstanding high levels of boost. 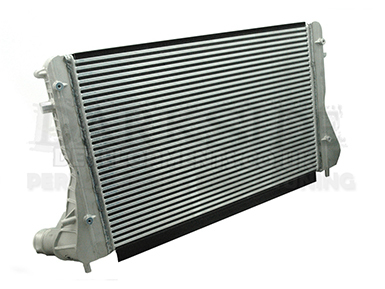 Intercoolers with plastic end tanks for instance can often separate from the metal core of the intercooler or break the clip connections. They are simply not designed to withstand the pressure a higher state of tune requires. 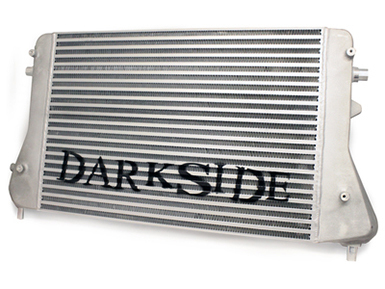 Its for this reason we produce the Darkside S3 Intercooler - while the OEM S3 intercooler is a popular upgrade for many cars, the Darkside intercooler replaces the plastic end tanks with metal ones as well as having a much thicker core, allowing it to hold high boost levels for years with no issues. The second reason to change an intercooler is to fit a unit which can flow more air. Generally with turbocharged cars, people can be so focussed on boost and temperatures that they forget this fundamental part of any high performance engine. An intercooler producing low intake temperatures will not produce good power if it is restrictive - and in terms of power, it is often the flow characteristics which make a bigger difference. A Transporter T5 we tuned recently was fitted with a well known aftermarket intercooler. After fitting one of our GTB turbo kits, we were struggling to make the power we expected. Intake air temperatures were relatively low, so the intercooler was cooling effectively - however it was clear looking at the intercooler, and in particular the end tanks that the design was very poor in terms of airflow. 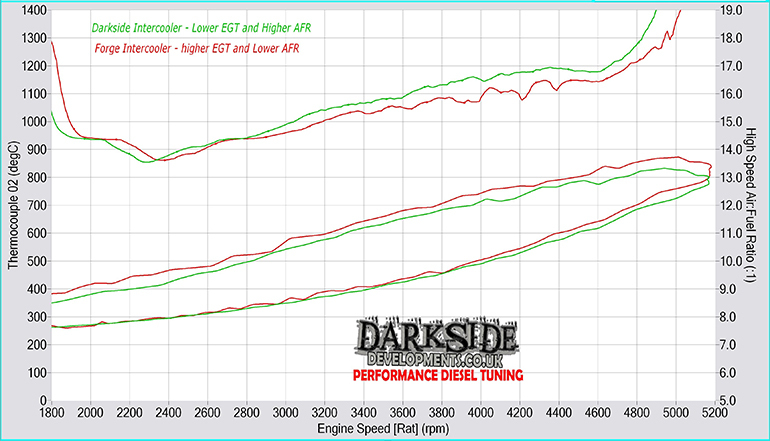 Fitting a Darkside Intercooler (with no additional tuning) gained an additional 9hp and 10lbs across the whole rev range, and increased Air to Fuel Ratio (reducing smoke). All of this was at roughly the same intake air temperature - increased airflow also assists in reducing exhaust gas temperatures which dropped by 50 Degrees Centigrade. In every part of every engine build, airflow should be a top priority, and intercoolers are no exception. An intercooler is only going to work well if a large amount of cool air can get to it - hence why most aftermarket units are front mounted where the airflow is. Some bumpers as standard lend themselves well to allowing air to get to an intercooler, but some are extremely poor, A polo for example is much more difficult to cool than a Fabia or Ibiza despite sharing all the same hardware. If your bumper is covering a large portion of the intercooler it is worth doing what you can to get more air to it - whether this be chopping some out, removing some grilles or fitting a different bumper which is more open. Owners forums are often helpful with information such as this, and with any of our kits we can always provide guidance on the best ways to make sure the intercooler is getting the airflow it needs. It's also worth checking that the AC condenser is in good condition, stones and other road debris cause damage that severely restricts airflow through the system. We stock a wide variety of intercooler kits, which have been fitted to hundreds of cars. With our project cars ranging from daily drivers, to dedicated track and racecars, and to our Seat Arosa 9 second drag car, our kits have been tested and developed in the widest range of situations.